Have you heard about the so-called “tetrad of lunar eclipses” to occur on Jewish Holy Days in the next two years (2014-2105) and how this is to be a “sign from God” of something significant coming to Israel? This “theory” was conceived by a pastor named Mark Biltz, afterwhich he wrote a book about it called “Blood Moons: Decoding the Imminent Heavenly Signs”. Pastor John Hagee then latched onto this idea and used his powerful TV pulpit position to spread the book’s message far and wide. The problem is … the “theory” is VERY WEAK!!! I’ve been wanting to blog about this for some time now (ever since first coming across it last year) to point out how “thin” the theory’s assertion is! Well, that time has finally come, for this past week I ran across a YouTube video from a man who does a great job THOROUGHLY debunking the theory! So, instead of me writing all about it …I’m simply going to link his video below, so in a few short minutes you can absorb the TRUTH (or lack of) of this matter. If you’ll put on your thinking caps and watch the video, you will learn how common it is for blood moons to occur on Jewish Holy days. 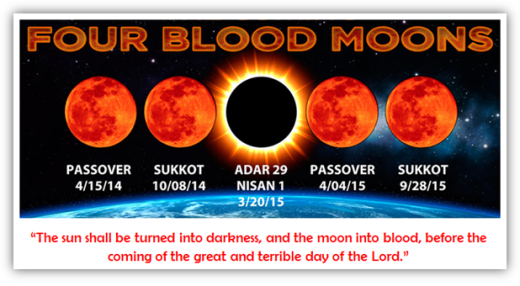 You will learn Biltz had to ignore two other “blood moon tetrads” that occurred in the past 2,000 years because nothing significant happened to Israel during them. Then, you will learn the “significant events” Biltz attributes to the other 3 blood moon tetrads didn’t really happen during those years anyway! And finally, to assert something “significant” is coming to Israel in the next two years because of this “blood moon tetrad” theory is just plain NONSENSE!!! Folks, you have to pay attention to what you listen to these days, because there are people in the “ministry” who are desperate to take your money every chance they get!!! They will write books on just about anything they can come up with to interest you and take your money. So please be careful! Give your hard earned money to your neighbor in need, and not some covetous preacher! Are “significant things” going to happen to Israel in the next two years, or within the next 6 years? Most likely, but it’s NOT going to be because of a tetrad of blood moons occurring on Jewish Holy Days in the next 2 years! Approximately 767 Weeks (Sabbaths) Remaining Till Christ's Return! One more thing I wanted to mention, folks ... Have you ever noticed how all these "date setters" come out with a "date" that is always just a year or so in the future until it's supposed to happen? THAT should be your FIRST CLUE that something is off with the message! Like Harold Camping's May 21, 2011 Judgment Day date ... when did we first start hearing him say this? 2010 !!!! Just ONE YEAR before the "supposed date". How about the Dec 21, 2012 Mayan "end of the world" "pole flipping" "major worldwide catastrophe" date? Try about 2008 or so, when we first started hearing about it. This gave them 4 years to print books, produce movies, write blogs, and create TV documentaries ALL TO MAKE MONEY FROM YOUR INTEREST IN THEIR LIE!!!!! So here again ... now comes some dude, Mark Biltz, writing a book a year or so before something BIG could supposedly happen !!! Ugghhhh!!!!!!!!! Don't you get it, folks??? Here's the deal ... "Date Setting" is BIG MONEY!!!!!!!!!! And even the mainstream worldly people know it now, and have got in on the action with the Mayan crap. Please watch your backs, folks. These imminent date-setting people are out to take your money, their out to make money of you!!! Or another guy Tim LaHaye with his book "LEFT BEHIND" false theory of the Rapture before Tribulation who made lots of money from selling books and films based on it. Yup, you got it, Robbie! Just more lies!